Joseph Walton Losey III (January 14, 1909 – June 22, 1984) was an American theatre and film director, born in Wisconsin. After studying in Germany with Bertolt Brecht, Losey returned to the United States, eventually making his way to Hollywood. In the 1950s Losey was blacklisted in the United States and moved to Europe where he made the remainder of his films, mostly in the United Kingdom. Among the most critically and commercially successful were three films with screenplays by Harold Pinter, The Servant (1963), Accident (1967) and The Go-Between (1971). Joseph Walton Losey III was born on January 14, 1909 in La Crosse, Wisconsin, where he and Nicholas Ray were high-school classmates. He attended Dartmouth College and Harvard University, beginning as a student of medicine and ending in drama. Losey became a major figure in New York political theatre, first directing the controversial failure Little Old Boy in 1933. He declined to direct a staged version of Dodsworth by Sinclair Lewis, which led Lewis to offer him his first work written for the stage, Jayhawker. Losey directed the show, which had a brief run. Bosley Crowther in The New York Times noted that "The play, being increasingly wordy, presents staging problems that Joe Losey's direction does not always solve. It is hard to tell who is responsible for the obscure parts in the story." In 1935 he visited the Soviet Union for several months to study the Russian stage. In Moscow he participated in a seminar on film taught by Sergei Eisenstein. He also met Bertolt Brecht and the composer Hanns Eisler who were visiting Moscow at the time. In 1936 he directed Triple A Plowed Under on Broadway, a production of the WPA's Federal Theatre Project. He then directed the second Living Newspaper presentation, Injunction Granted. From 1946 to 1947 Losey worked with Bertolt Brecht, who was living in exile in Los Angeles, and Charles Laughton on the preparations for the staging of Brecht's play Galileo (Life of Galileo) which he and Brecht eventually co-directed with Laughton in the title role, and with music by Eisler. The play premiered on July 30, 1947, at the Coronet Theatre in Beverly Hills. On October 30, 1947 Losey accompanied Brecht to Washington DC for Brecht's appearance before the House Un-American Activities Committee (HUAC). Brecht left the US the following day. Losey went on to stage Galileo, again with Laughton in the title role, in New York City where it opened on December 7, 1947 at the Maxine Elliott Theatre. More than 25 years later Losey, in exile in England, would direct a film version of Brecht's play Galileo (1975). Losey's first feature film was a political allegory entitled The Boy with Green Hair (1947), starring a young Dean Stockwell as Peter, a war orphan who is subject to ridicule after he awakens one morning to find his hair mysteriously turned green. Seymour Nebenzal, the producer of Fritz Lang's classic M (1931), hired Losey to direct a remake set in Los Angeles rather than Berlin. In the new version, released in 1951, the killer's name was changed from Hans Beckert to Martin W. Harrow. Nebenzal's son Harold was associate producer of this version. The HUAC's longstanding interest in Losey was based on extensive - and error riddled - FBI files. In the 1930s and 40s he had had extensive contacts with people on the political left, including radicals and Communists or people who subsequently become such. He had collaborated with Brecht and had a long association with Hanns Eisler, both targets of HUAC's interest. Losey had written to the Immigration and Naturalization Service in support of a resident's visa for the composer, who had many radical associations. They had collaborated on a "political cabaret" from 1937 to 1939. Losey had invited Eisler to compose music for a short public relations film he had been commissioned to produce for presentation at the 1939 New York World's Fair, Pete Roleum and His Cousins. Losey had also worked on the Federal Theatre Project, long a target of HUAC. Triple-A Plowed Under, on which Losey had worked, had been denounced by HUAC's antecedent, the Dies Committee as Communist propaganda. His Hollywood collaborators included a long list of other HUAC targets, including Dalton Trumbo and Ring Lardner Jr.
Losey's first wife Elizabeth Hawes worked with a wide range of Communists and anti-Communist liberals at the radical newspaper PM. After their divorce in 1944, she wrote about working as a union organizer just after World War II, where "one preferred the Communists to the Red-Baiters". At some point, probably early in the 1940s, the FBI was maintaining dossiers on both Losey and Hawes. His included charges that he was a Stalinist agent as of 1945. I had a feeling that I was being useless in Hollywood, that I'd been cut off from New York activity and I felt that my existence was unjustified. It was a kind of Hollywood guilt that led me into that kind of commitment. And I think that the work that I did on a much freer, more personal and independent basis for the political left in New York, before going to Hollywood, was much more valuable socially. I was offered a film called I Married a Communist, which I turned down categorically. I later learned that it was a touchstone for establishing who was a "red": you offered I Married a Communist to anybody you thought was a Communist, and if they turned it down, they were. Hughes responded by holding Losey to his contract without assigning him any work. In mid-1949, Schary persuaded Hughes to release Losey, who soon began working as an independent on The Lawless for Paramount Pictures. Soon he was working on a three-picture contract with Stanley Kramer. Then his name was mentioned by two witnesses before HUAC in the spring of 1951. Losey's attorney suggested arranging a deal with the committee for testimony in secret. Instead Losey abandoned his work editing The Big Night and left for Europe with his wife Louise a few days later, while HUAC took weeks to try unsuccessfully to serve him with a subpoena compelling his testimony. I was [in the United States] for about a month and there was no work in theatre, no work in radio, no work in education or advertising, and none in films, in anything. For one brief moment, I was going to do the Arthur Miller play, The Crucible. Then they got scared because I had been named. So after a month of finding that there was no possible way in which I could make a living in this country, I left. I didn't come back for twelve years.... I didn't stay away for reasons of fear, it was just that I didn't have any money. I didn't have any work. He returned briefly to Rome and settled in London on January 4, 1953. He settled in Britain and worked as a director of genre films. His first British film, The Sleeping Tiger (1954), a noir crime thriller, under the pseudonym Victor Hanbury, because the stars of the film, Alexis Smith and Alexander Knox, feared being blacklisted by Hollywood in turn if it became known they had worked with him. The Intimate Stranger (1956) carried a pseudonym as well. His films covered a wide range from the Regency melodrama The Gypsy and the Gentleman (1958) to the gangster film The Criminal (1960). Losey was also originally slated to direct the Hammer Films production X the Unknown (1956), but after a few days' work the star Dean Jagger refused to work with a supposed Communist sympathiser and Losey was removed from the project. Losey was later hired by Hammer Films to direct The Damned, a 1963 British science fiction film based on H.L. Lawrence's novel "The Children of Light". In the 1960s, Losey began working with playwright Harold Pinter, in what became a long friendship and initiated a successful screenwriting career for Pinter. Losey directed three enduring classics based on Pinter's screenplays: The Servant (1963), Accident (1967) and The Go-Between (1971). The Servant won three British Academy Film Awards. Accident won the Grand Prix Spécial du Jury award at the 1967 Cannes Film Festival. The Go-Between won the Golden Palm Award at the 1971 Cannes Film Festival, four prizes at the 1972 BAFTA awards, and 'Best British Screenplay' at the 1972 Writers' Guild of Great Britain awards. Each of the three films examines the politics of class and sexuality in England at the end of the 19th century (The Go-Between) and in the 1960s. In The Servant, a manservant facilitates the moral and psychological degradation of his privileged and rich employer. Accident explores male lust, hypocrisy and ennui among the educated middle class as two Oxford tutors competitively objectify a student against the backdrop of their seemingly idyllic lives. In The Go-Between, a young middle class boy, the summer guest of an upper-class family, becomes the messenger for an affair between the daughter of his hosts and a working class farmer. Although Losey's films are generally naturalistic, The Servant's hybridisation of Losey's signature Baroque style, film noir, naturalism and expressionism and both Accident's and The Go-Between's radical cinematography, use of montage, voice over and musical score amount to a sophisticated construction of cinematic time and narrative perspective that edges this work in the direction of neorealist cinema. All three films are marked by Pinter's sparse, elliptical and enigmatically subtextual dialogue, something Losey often develops a visual correlate for (and occasionally even works against) by means of dense and cluttered mise en scene and peripatetic camera work. In 1966 Losey directed Modesty Blaise, a comedy spy-fi film produced in the United Kingdom and released worldwide in 1966. Sometimes considered a James Bond sendup, it was loosely based on the popular comic strip Modesty Blaise by Peter O'Donnell. Losey also worked with Pinter on The Proust Screenplay (1972), an adaptation of A la recherche du temps perdu by Marcel Proust. Losey died before the project's financing could be assembled. In 1975 Losey realized a long-planned film adaptation of Brecht's Galileo released as Life of Galileo starring Chaim Topol. Galileo was produced as part of the subscription film series of the American Film Theatre, though it was shot in the UK. In the context of that production, Losey also made a half-hour film based on Galileo's life. Losey's Monsieur Klein (1976) examined the day in Occupied France when Jews in and around Paris were arrested for deportation. He said he so completely rejected naturalism in film that in this case he divided his shooting schedule into three "visual categories": Unreality, Reality and Abstract. In 1979 Losey filmed Mozart's opera Don Giovanni, shot in Villa La Rotonda and the Veneto region of Italy: this film was nominated for several César Awards in 1980 including Best Director. He demonstrated a facility for working in the French language and Monsieur Klein (1976) gave Alain Delon as star and producer one of French cinema's earliest chances to highlight the background to the infamous Vel' d'Hiv Roundup of French Jews in July 1942. In 1964 Losey told The New York Times: "I'd love to work in America again, but it would have to be just the right thing." He told an interviewer the year before he died that he was not bitter about being blacklisted: "Without it I would have three Cadillacs, two swimming pools and millions of dollars, and I'd be dead. It was terrifying, it was disgusting, but you can get trapped by money and complacency. A good shaking up never did anyone any harm." Dartmouth College, his alma mater, awarded Losey an honorary degree in 1973. In 1983, the University of Wisconsin-Madison did the same. Losey married three times and divorced twice. He married Elizabeth Hawes on July 24, 1937. They had a son, Gavrik Losey, in 1938, but divorced in November 1944. Gavrik helped out with the production on some of his father's films. Gavrik's two sons are film directors Marek Losey and Luke Losey. From 1956 to 1963 Losey was married to British actress Dorothy Bromiley. On July 16, 1957 they had a son, Joshua Losey, who has become an actor. Losey then married the former Patricia Mohan, who adapted Lorenzo Da Ponte's opera libretto for Losey's Don Giovanni and Nell Dunn's play for Steaming. He died at his home in London on June 22, 1984 following a brief illness, just four weeks after completing his last film. 1 2 Brouwer, Scott. "FilmFreaks: Nicholas Ray & Joseph Losey". La Crosse Public Library Archives. Retrieved 2016-09-22. 1 2 3 4 5 Apple, Jr., R.W. (June 23, 1984). "Joseph Losey, Film Director Blacklisted in 1950's, Dies at 75". New York Times. Retrieved April 3, 2013. 1 2 Brody, Richard (November 8, 2012). "DVD of the Week: Joseph Losey's "Mr. Klein"". The New Yorker. Retrieved April 4, 2013. 1 2 3 4 Archer, Eugene (March 15, 1964). "Expatriate Retraces his Steps". New York Times. Retrieved April 3, 2013. ↑ Crowther, Bosley (November 6, 1934). "Fred Stone as a Civil War Senator...". The New York Times. Retrieved April 3, 2013. ↑ See Michel Ciment: Conversations with Losey. London New York: Methuen, 1985, p. 37. ↑ See Robert Cohen: "Bertolt Brecht, Joseph Losey, and Brechtian Cinema." "Escape to Life:" German Intellectuals in New York: A Compendium on Exile after 1933. Eckart Goebel and Sigrid Weigel (eds.). De Gruyter, 2012. 142-161, here p. 144 ff. ↑ McGilligan, Patrick (2011). Nicholas Ray: The Glorious Failure of an American Director. NY: HarperCollins. pp. 64–5. ↑ Atkinson, Brooks (July 25, 1936). "The Play: WPA Journalism". The New York Times. 1 2 See Cohen, "Bertolt Brecht, Joseph Losey," p. 149. ↑ See FBI files on Losey: file # 100-343468; and file # 100-8587, vol. 2 (vol. 1 is on Elisabeth Hawes). 1 2 3 4 5 6 7 8 9 10 Gardner, Colin (2004). Joseph Losey. Manchester University Press. pp. 8–11. ↑ Palmier, Jean-Michel (2006). Weimar in Exile: The Antifascist Emigration In Europe And America. NY: Verso. pp. 532, 802n131. ↑ Horowitz, Daniel (1998). Betty Friedan and the Making of the Feminine Mystique: The American Left, the Cold War and Modern Feminism. p. 129. ↑ Milne, ed., Tom (1968). Losey on Losey. Garden City, NY: Doubleday & Company. p. 73. ↑ Hoberman, J. (2011). An Army of Phantoms: American Movies and the Making of the Cold War. NY: New Press. p. 174. ↑ French, Philip (May 23, 2009). "Blacklisted but unbowed". Guardian (UK). Retrieved April 3, 2013. ↑ "R U Sitting Comfortably - Dean Jagger". RUSC.com. Retrieved 2 May 2016. ↑ Sanjek, David. "Cold, Cold Heart: Joseph Losey's The Damned and the Compensations of Genre". senses of cinema. Retrieved 2 May 2016. ↑ "Accident". Festival Archives. Festival de Cannes. Retrieved April 3, 2013. ↑ "Elizabeth Jester Wed". New York Times. July 24, 1937. Retrieved March 31, 2013. ↑ Berch, Bettina (1988). Radical by Design: The Life and Style of Elizabeth Hawes. NY: Dutton. p. 103. ↑ While Losey has been credited as the director of Pete Roleum and his Cousins, Helen van Dongen wrote that he was its producer, and that she had directed and edited the film. See Durant, Helen; Orbanz, Eva (1998). Filming Robert Flaherty's Louisiana Story: The Helen Van Dongen Diary. The Museum of Modern Art. p. 121. ISBN 9780870700811. A number of published sources list this as the first film directed by Joseph Losey; however, Helen van Dongen recalls 'Joseph Losey was the producer ... It was I who made all the breakdowns and sketches for the changes in facial expressions and movement frame by frame'. Caute, David (1994). Joseph Losey: A Revenge on Life. Faber. ISBN 978-0-571-16449-3. 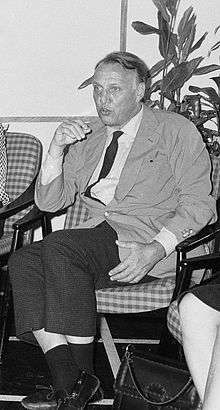 Wikimedia Commons has media related to Joseph Losey.